Our Stage 1 kit featuring a cold-air intake kit and performance software. 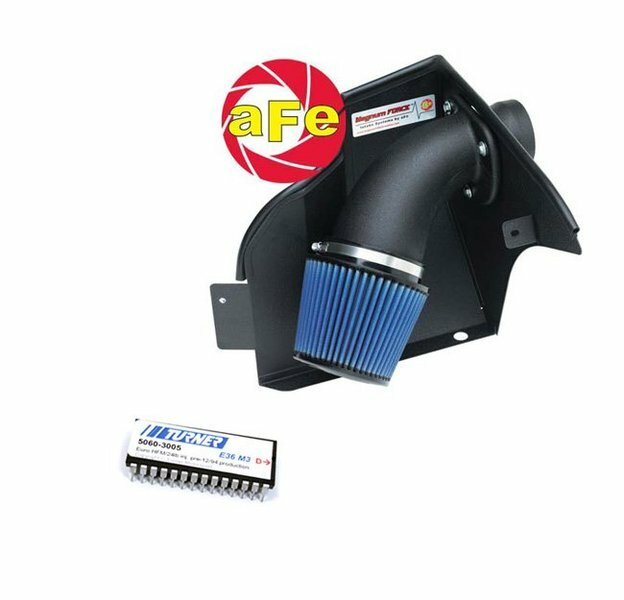 The aFe cold air intake is made with heat-blocking materials, reducing underhood temperatures and not contributing to heat soak of the air filter. aFe uses an oiled air filter for maximum air flow and excellent filtration. The kit is supplied complete with heat shield, intake tube, sealing materials, hardware, and install instructions. Our TMS Performance Chips were also developed by Jim Conforti. The chip is the safest and easiest way to get big power from your engine. Our chips require premium fuel (91 or higher) and allow us to alter the settings on the engine management. Because we can be more aggressive in our tuning, we can get a lot of horsepower for very little money. Related Upgrades: We are often asked what would complement our software and intake packages. Within any Stage, we recommend our Underdrive Power Pulley Kits and a cat-back exhaust. The Power Pulley Kit will under-drive the alternator, water pump, and power steering pump. Under-driving means each component is moving slower which requires less power. The saved horsepower is put back to the engine where it transfers to power at the wheels. Power gains are typically 10 horsepower at the wheels. We also recommend upgrading the cat-back muffler for slightly more performance, lighter weight, and a more-aggressive sound. Our favorite E36 M3 mufflers are the Supersprint, Borla, or Corsa exhausts. The Supersprint is the quietest and most like stock while the Corsa is the most aggressive (Borla being in the middle). You can expect a gain of 5whp with any of these exhausts.